I’m all about the layers in the winter. This is a J. Crew sweater (old, similar) from my sister that I may have accidentally shrunk into a crop sweater. Shrinking it turned it into the perfect layering piece! I’m still very obsessed with these Shooz on 7 boots (sold out, similar, last seen here). And wearing them every chance I have. Although I’m on the fence if they can be work appropriate or not. If your office is more casual and it’s Friday, I think they would it work. However, I always feel like I should be in heels at the office, but that could be a symptom of being very short. Taller people are What do you think? Cute outfit! I’m loving that scarf and those boots! Really cute winter layers Kate! It worked out that your sweater shrunk because now you can layer it over shirts ;). 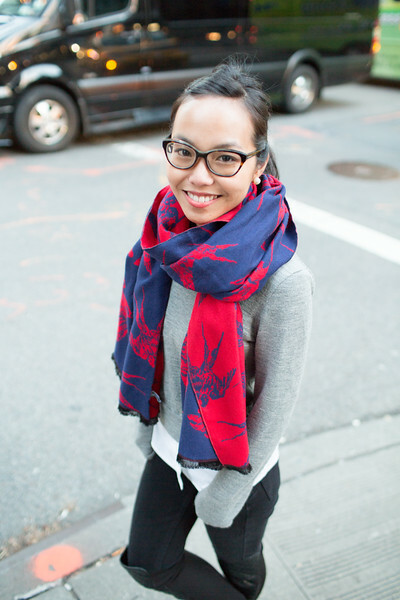 Love you in glasses and love that statement scarf!